It's officially the second half of the Premier League season. Unfortunately, Boxing Day's scoring rate is unlikely to continue after four teams scored at least three goals, including two with five. It was the same situation last campaign, but the following matches had much fewer goals, as 16 of the 20 teams scored one goal or zero. That may not happen again, but lineups will surely look a bit different because a lot of the top players have been pushed in the last week. 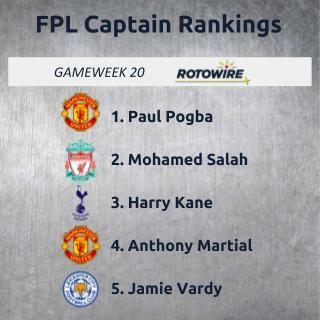 Surprisingly, Manchester United may be the first team a lot of fantasy bosses turn to for captaincy. Without Jose Mourinho, the Red Devils have been a much different team, scoring eight goals in their last two matches. A revived Paul Pogba is reason for that, and while it's hard to give him the armband, he has two goals on five shots on target and two assists from five chances created since Ole Gunnar Solskjær has been in charge. Pogba has been a completely different player and faces a Bournemouth side that hasn't been able to compete against the top clubs and just gave up five goals at Tottenham. In fact, Pogba may be the best route because it's unknown what the trio up front will look like, with Anthony Martial and Romelu Lukaku possibly returning to the starting XI. The other major team at home is Spurs, though the matchup isn't as fruitful against Wolves, who have played well against top teams. The other issue is figuring out which players will make the starting squad since all of the regulars have been in the last few outings. Son Heung-Min surely has to be in the conversation with back-to-back braces, and some may even consider him over Harry Kane. It's hard to see Christian Eriksen getting another start, so it's more of a decision between Son and Kane. Kane played 11 more minutes on Boxing Day, so that's something to consider, while it's a little harder to bank on Son because he's a bit more active on the field. Manchester City also have a decent matchup at Southampton, but the team has oddly been in a funk since Kevin De Bruyne returned from injury. They'll undoubtedly score, but there is some risk in captaining guys like Sergio Aguero, Raheem Sterling and Leroy Sane, as they all played a full 90 on Wednesday. It wouldn't be surprising if Gabriel Jesus and David Silva took someone's spot in the starting XI. Because of that, I'd probably put Jesus at the top of the captaincy list for City, though he's still harder to trust than guys from Tottenham and Man United. Liverpool host Arsenal in what should be a fun match, and while I tend to avoid bigger matches like this, the Gunners haven't played great defense on the road. Those issues will only be compounded by a Liverpool side that has scored at least three goals in five of the last six meetings. Of course, they drew back in early November, but that also came at the Emirates. It's hard to see top players getting rested in this matchup, so Mohamed Salah should be a favorite once again after having six goals and two assists in his last five starts in all competitions. Sadio Mane is on the same level as some of the Man City players, while Roberto Firmino remains out of the equation. The matchup looks nice for Chelsea, but I'm not confident that Eden Hazard makes the starting XI and scores at Crystal Palace. He's dealt with minor knocks recently, and pushing him on a short week will be difficult, not to mention Palace have found some form, averaging fewer than one goal allowed at home. For the differential crowd, this is a perfect week for Aleksandar Mitrovic to find the back of the net against Huddersfield. While Fulham didn't score in the first meeting, they're much more productive at home and Mitrovic is coming off a match in which he had eight shots, including three on target. Leicester are also at home again and face lowly Cardiff, so Jamie Vardy enters the captain conversation for the first time in a long time. Cardiff just held Palace scoreless on the road, but that's not something to be afraid of after Leicester just topped Man City. Vardy has jumpstarted the Foxes with three goals and an assist in his last five appearances. He doesn't get a ton of opportunities, but he knows how to finish. Everton face a feisty Brighton team at home where they just contained Arsenal, so I'm not as high on Richarlison or Gylfi Sigurdsson. That may be it for the low-end options because you never know who the scorers will be for Watford (v. Newcastle) or West Ham (at Burnley). That said, the possible return of Marko Arnautovic would change things a bit, and he could deserve some captain consideration against a Burnley team that allows more shots than any other team. Felipe Anderson and Robert Snodgrass are in the mix because of that, but both are threats to be rested.